I’ve got some low capacity ‘junk’ cells. I use those for testing unknown situations. Not of much use for high draw applications but work OK for other stuff. I just unscrew a few threads , and no drain. ¼-turn is usually enough to break contact, and not engage if you squeeze it together, but I give it about ½-turn to be sure. With battery in place and back off, turn the switch on. Then screw it slowly in. It will light when it makes contact. Or reverse the process. You can tell when it loses contact. 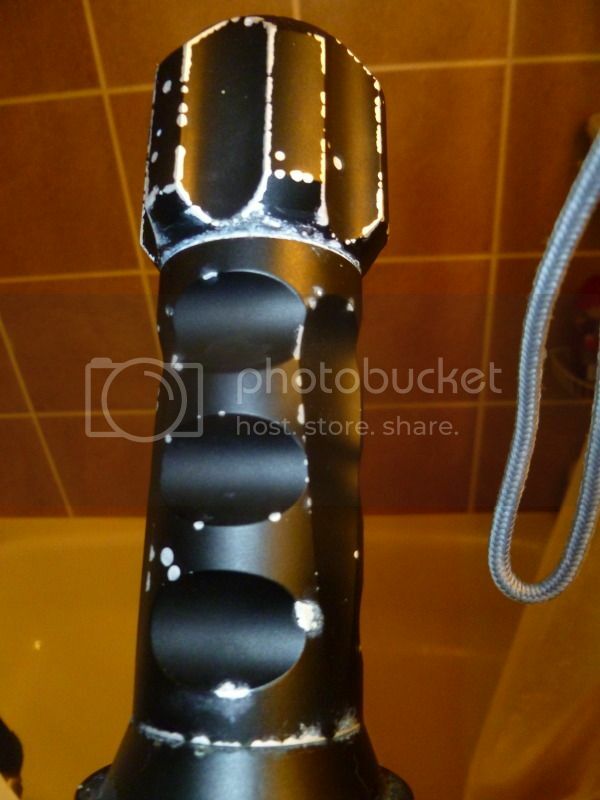 Plus, that tiny amount is not enough to compromise waterproof integrity if that is an actual issue. Some dive lights use screwing the back in/out as the way to turn them on. It’s simple, effective, and removes one other source of potential water entry via a switch. But that puts the tailcap and rest of the light at 2 different potentials, VASTLY increasing the potential for corrosion with the slightest scuff to the anodisation. The water acts as a bridge across the non-contacting pieces. I’d much rather have the magnetic slider that the DV-S9 has. Zero chance of ingress from there. Mmmm, the light I currently have that works that way is plastic so corrosion is not an issue. It’s by Underwater Kinetics and is designed and specifically made for diving by a diving light company. 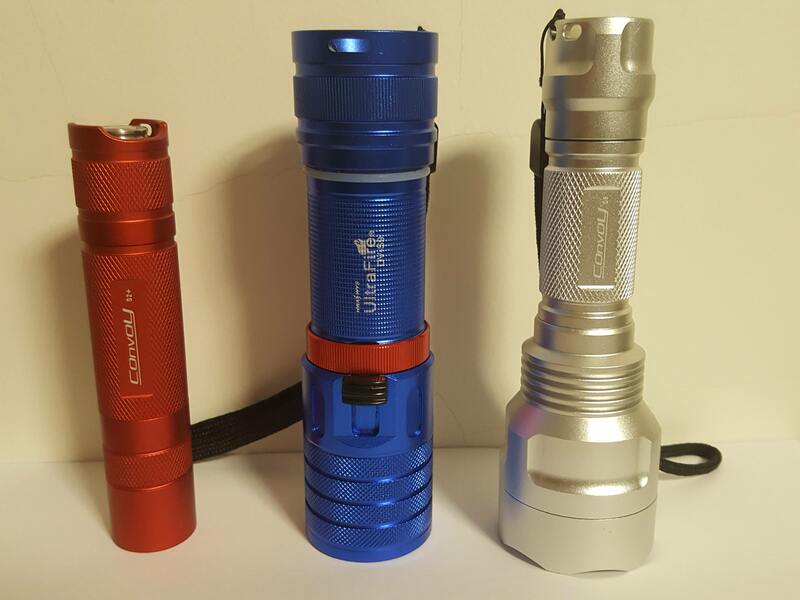 There are similar dive lights via similar companies. One of their high power LED actually has a heat sink that comes out thorough the front lens since it does not have a good path to heat sink the LED pill via the plastic body. My 3xC-cell light has a full length metal tube down inside the body to draw heat out of the pill and distribute it. The UK light is fine. It’s a backup light so rarely gets used. I’m looking for something smaller, lighter, and working toward migrating more exclusively to Li-on. Single cell lights are now almost as good as my 4 year old canister light. Not quite, but pretty close. Just took some beamshots and the UltraFire doesn’t look more green than a different light with CW emitter, so it’s probably just my eyes that have become accustomed to neutral white tints. This particular switch is pretty clever. There are no springs and the only part for potential corrosion is the magnet in that little slider. A couple other “dive lights” with Hall sensors I got have springs and things on the outside. Sure, no hole through the light for a switch, BUT the mechanism is cheap carbon steel and rusts out fast in saltwater immersion use. This is the first light I’ve gotten that does not do that. Seems reasonably solid. FWIW, the seal on the back of a twisty is just as vulnerable when static as dynamic as long as the O-rings are in good shape, well lubed, and not contaminated with cat hair or other debris. Most floods of a properly designed light are user errors. MANY floods on Chinese lights are due to shoddy materials and poor workmanship. I don’t trust ANY of them until checked out thoroughly and defects corrected…..if possible. It’s one thing to have a light fail on a dark walk. It’s entirely another if you are depending on it during a dive. That’s why we carry 2 (or more) lights. Does that red ring unscrew so you can remove the switch? It does on the UKing but I didn’t try it DV, which I gave away to another diver. Yeh, absolutely. Was wondering what was its purpose, so of course had to try it. All it does is keep the slider from falling out. If you do take out the slider, it’ll only work if the “polarity” is right, so if it doesn’t turn on, remove it and flip it around. Took the UKing (pretty close to the DV) on a dive yesterday. Used it for ~1 hour with a Lii-26650. Worked fine, nice spot. Came back with ~ half capacity. Yeah, forgot offhand what I measured, but I think it was under 2A. Think I got an old Rat Shack 26650 (“DE”, “Digital Energy” or something) in it, not any of my LKs. <2A ain’t gonna stress it out much. Flydiver- were you in salt water or fresh? How deep did you go? Salt. This wasn’t a deep one, 60 feet/68 minutes. What I like about this light is the apparent lack of external springs that rust out in many of the other models of cheap dive lights not ACTUALLY designed for serious diving. This one might work out. Oh, and NO modes…just the slider from dimmer > full on. Gotta like that. 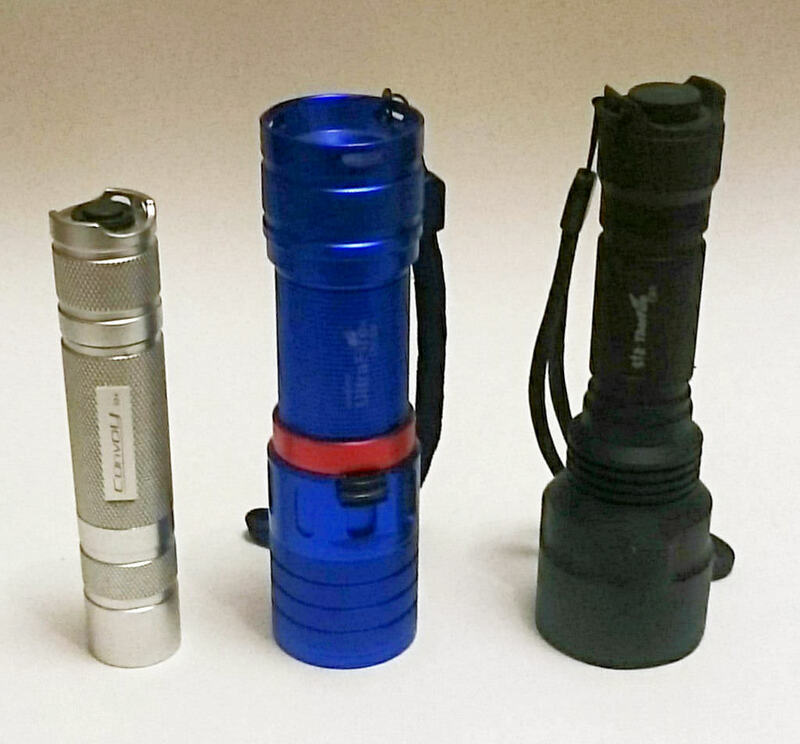 It’s maybe 200 lumens and wouldn’t survive a prolonged exposure in a mud puddle. It’s a joke as a dive light and pretty much a lousy light. But… but… it’s a Probe Shiny! They sure do seem to love ’5’s, don’t they? 5000lm, 500m depth, what else? Hey, they even include a 3×AAA holder, to really belt out those 5000lm! Interesting. I will keep my eye out for a bargain. 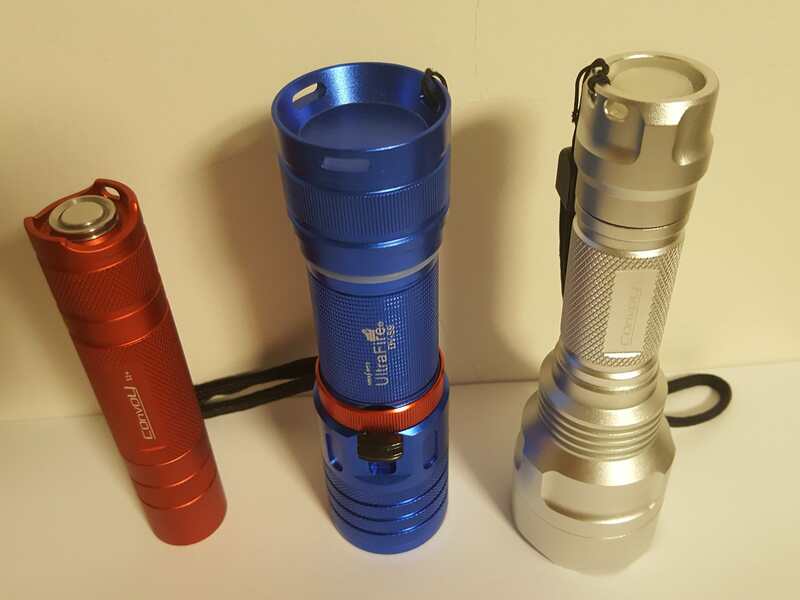 Since most members here have a Convoy S2+ and C8 flashlight, I took a couple of photos of the DV-S9 next to them. Unfortunately, mine stopped working after dropping it on lino flooring – from only about 2½ feet! I took a (blurred and grainy) photo, anyway. 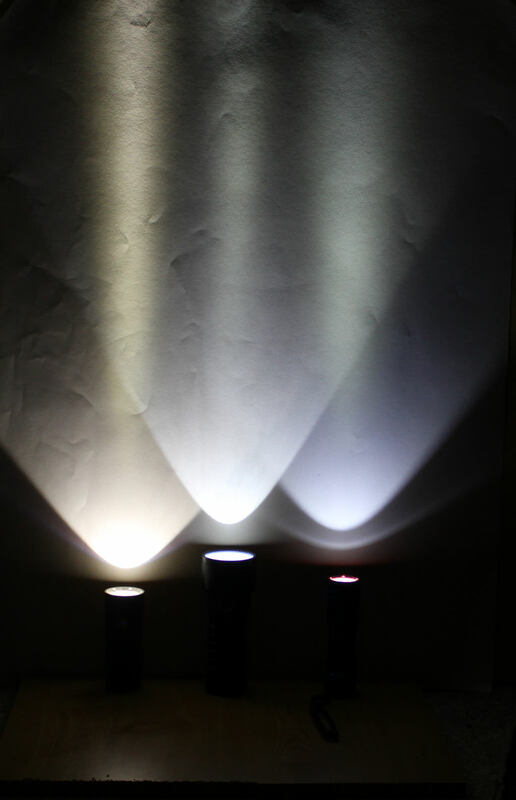 I just received a DV-S9 from FT – under $18 with BLF code, and i’m impressed. Very nice 26650 light with magnetic switch for the price. Although it’s not a top performer it seems, i especially like the slider smooth operation…. I lubed the tail cap and o-rings while loading a 26650. Not sure when/if i will have a chance to use it underwater. I got it as a backup to a (still unused) Solarstorm DX4. PS: thanks to the above comments about the red ring preventing the switch to fall off. Mine was loose and i wasn’t sure what this ring was about nor did i noticed it would actually screw in. I would probably have lost the slider at some point. PS2; I’m considering the DV-S5 as a backup to the DV-S9… Anyone tried it? Ewww. SOS mode in a diving light?? I don’t know how to test this but I believe the flashlight has a rather high parasitic drain. I left a battery in there unused for several weeks (< 1 month), and the battery was drained to below 2V when I tried to use the flashlight. As this isn’t a flashlight I would use once every week, I don’t leave battery in there anymore till I want to use it. Even when “off”, the Hall-effect circuit for the slider draws something like 10mA. I mentioned it somewhere in this thread, so I think that’s how much it was. Not at all unusual or unreasonable. But yeah, I always gave the beastie a quarter-turn lockout when not in use. Diving lights can also be used to pick up divers from the surface if they get caught in a current and drift away from their dive site. Sounds like a good idea to me. Did a 31 dive vacation (Lembeh, Indonesia) beginning of the month. The DV-S9 worked without a problem going to 90+ feet a few times. The only unexpected issue was the magnet is embedded in the black slider. This was a sandy area (muck diving for weird critters) and the light would often rest on the bottom during during photos. It picked up iron grit. Didn’t affect use in any way. I didn’t even notice it until I got home and was cleaning things up thoroughly. I was able to remove it with small strips of tape and finished with high pressure air. I did notice some minor fogging in the lens with use. There were a couple micro-drops on the lens. There was no evidence at all of flooding from the front or back. I think it was condensation, probably during assembly. Removed the front lens. The red rig holding the lens in has a silicone O-ring and there is a main O-ring under the lens. It’s been fine on extended dunk tests but has not gotten a dive test since the disassembly. 90’? Yeesh, think my eardrums would pop. Good to know it holds up to that kind of pressure, though! So it’s definitely safe for me to use whilst changing a tire in the rain, then. I would stay away from diving with this light or any other that runs current though the body. On ships they place aluminum or magnesium plates on the hull to corrode before the steel hull does. Run a current from tail to head and your light will dissolve away. You forget to mention a very important point about this particular light you show. The light you show uses the tail cap as a switch. So when you’re under water and it’s switched off, there’s a potential difference between the tail cap and the body, and THAT’s what causes electrolyses. 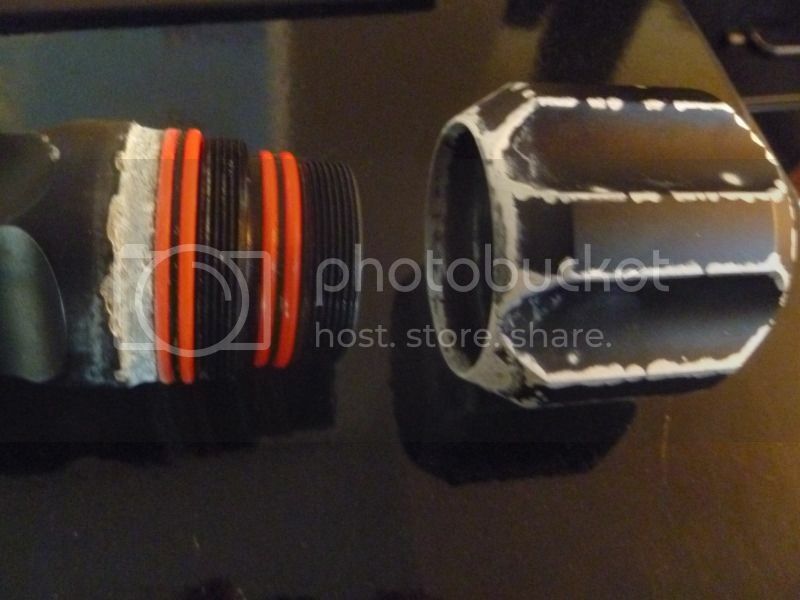 There is no electrolyses when the tail cap is in the “ON” position, because then the parts connect shorting the potential difference between tube and tail. I’ve been ogling these slider diving lights for some years now, but i have never seen a review that answers the PWM question. So, this one uses PWM (i guess they all do because it seems to be cheaper), and it’s reasonably high frequency PWM. Can you try shining it on a black fabric and listen? I really like the concept of a slider dimmer, but it’s often implemented quite crappily.. The travel of the slider is often very short too, but maybe that’s no problem. Thanks for the review, Lightbringer. That would make it a poor backup light if this is a problem. If it’s screwed down and on there should not be a problem, right? I have not had this particular issue.